You haven’t really tried a jackpot slot if you have have never played the Mega Moolah jackpot slot! Toss yourself in the big adventure by playing this online and mobile slot aslo know as “The Money Maker”. Enjoy thrilling progressive jackpots, the one-one-a-kind graphics, the unrivalled gameplay and the stunning music and animations. Microgaming Casino houses one of the biggest Progressive jackpot slots to hit the online gaming industry, Mega Moolah. The African animal-themed slot brings you wild winning and hours of fun. Mega Moolah is the first tiered progressive jackpot slot and can make you an instant millionaire! This slot has 5×3 reels, 25 fixed Paylines multiple coin game, with Scatter symbols which can trigger 15 Free Spins where wins are tripled and can be retriggered. 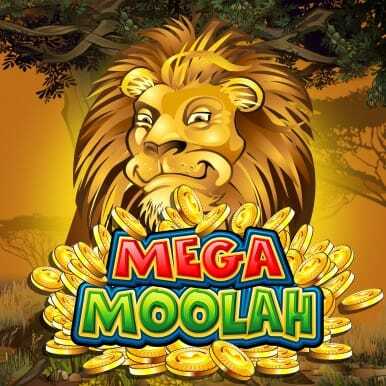 Mega Moolah Jackpot brings lots of colours and cheerful animals such as the buffalo, giraffe, zebra and elephant, brings you a pathway of rewards packed with stunning graphics. The other symbols are comprised of the card letters and numbers such as: A, K, Q, and J, and the numbers 10 and 9. The feature-rich Mega Moolah is filled with action! Spin the sunny Jackpot Wheel in a quest on the four tiered progressive. Play for the top prize of at least a million! The next level down is the Major, which starts at $/€10,000, followed by the Minor level at $/€100 and the consolation prize in the Mini level with winnings of at least $/€10. To win the jackpot, you spin a fortune wheel with white, yellow, orange, and red slots. There is also one white slot called the Mega Jackpot. When you land on this space, and you will win at least one million in USD, EUR and GBP. In addition to the white space, there are three yellow spaces (Major Jackpot), six orange spaces (Minor Jackpot), and 10 red spaces (Mini Jackpot). The more you bet, the greater your chances of winning the progressive jackpot. For example, Royal Vegas was proud to announce a Mega Moolah Jackpot winner who walked away with an amazing $7,5 Million in April 2015. This lucky man won the main jackpot while playing on his mobile device! Dreams do come true and you could be the next lucky winner! Mega Moolah Jackpot really knows how to attract the online casino players by offering four Progressive Jackpots! A fraction of each spin bet is added (in real time) to these piles of money ensuring that the main prize will be lower than $1,000,000! Watch the jackpot meter climb daily as you get closer to become an instant millionaire. A very good news is that, there is no limit to how much the Progressive Jackpot can be – it just keeps growing until lucky player hits. Register at one of the popular Microgaming Casinos now for your chance to take home millions of dollars while playing free spins! It’s as easy as registering for a free account and you will be playing the Mega Moolah slot within seconds. Here is our list with online casinos that hosts Mega Moolah progressive jackpot (click here).